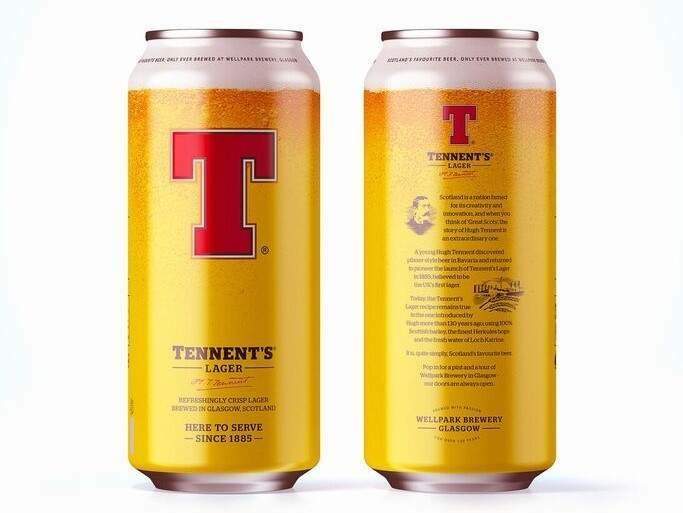 C&C Group has introduced new can designs for its Scottish beer brand Tennent’s Lager, as well as a wider range of size options for the beer. Credit: Tennent's. Irish beverage company C&C Group has introduced new can designs for its Scottish beer brand Tennent’s Lager, as well as a wider range of size options for the beer. The packaging has been designed to look like a freshly poured glass of Tennent’s and shares the brand’s story by detailing the founder Hugh Tennent’s journey through Bavaria where he learnt how pilsner-style brewing techniques. Tennent’s will now be available in the off-trade in a five litre mini-keg, six-packs of 330ml cans and 15-packs of 440ml cans, as well as individual 330ml, 440ml, 500ml and 568ml cans. Tennent’s Lager brand manager Rhona Fyfe said: “For drinkers in Scotland and abroad a pint of Tennent’s Lager is truly iconic, and we’re taking that image as the inspiration for our new cans. The design celebrates the liquid on the inside, which remains the same refreshing lager that was first brewed in 1885. The lager, which is claimed to be Scotland’s best-selling lager, is produced at Wellpark Brewery in Glasgow from 100% Scottish barley, Herkules Hops and water from Loch Katrine. In addition to its Tennent’s Lager, the company also produces a gluten free variant.